I baked my first challah last Thursday and wanted to share. I was unsure what to expect but it was so much fun. I’d been meaning for some time to bake a recipe from Maggie Glezer’s book, A Blessing of Bread, which is a wonderful compilation of traditional Jewish recipes from around the world. Floyd has written a very nice review of the book here. I decided to start with Glezer’s own personal recipe for sourdough challah. I love making sourdough and was interested to see what the texture of this bread would be compared to a yeasted challah which I have eaten only a couple times. The recipe seemed easy to me despite the fact Glezer calls it expert. I’m not sure why but, again, I’m new to challah. The dough was so easy to mix together and then, as Glezer puts it, the time involved is mostly waiting after that. She says to bake it to a dark brown which I did. I’m not sure if it is considered too dark or not but it was really a beautiful color and I do typically bake my bread darker as she instructs in Artisan Baking. The crumb was amazing to me. It was very creamy and soft and almost reminded me of an angel food cake. It has remained moist to this day (5 days later) as there are only two of us to eat and can’t quite get rid of all the bread I bake. I am going to cut very thick slices of what is remaining to freeze and later use to make French toast. I decided for my maiden voyage into challah bread I would make an elaborate braid. I used the six-strand braid version and got a lot of help from the video Glezer did showing how to do it. Gosh, the internet is awesome! Just as she said it makes a beautiful, very high loaf. I’m posting the recipe so those of you who are new to challah as I am can have a chance to make it and perhaps will be inspired to buy this lovely book. For those who have made challah for years I’d love it if you tried the recipe and let me know your thoughts on it compared the some of your favorite traditional recipes. Thank you to each and every one of you on this site that have been such inspirations in baking such as Floyd, Bill Wraith, Susanfnp, Mountaindog, JMonkey, Browndog, Bluezebra, Eric, SDBaker, Mini Oven, Dolf, Qahtan, Zainab and so many others. All you wonderful bakers have helped me incredibly along the way over the past few months that I have been baking so many thanks to all. Sweet sourdough breads are delicious and well worth the time (which is mainly waiting time) if you are a sourdough baker. The sourdough adds a subtle tang to my challah, and the crumb has a moister, creamier texture that keeps even longer than the yeasted version. While it’s true that challah or, for that matter, all bread was at one time sourdough (the Hebrew word for leaven, chametz, means “sour”), challahs have definitely gotten sweeter and richer since the introduction of commercial yeast. To convert such recipes back to 100 percent sourdough, the sugar has to be cut back in order for the dough to rise in a reasonable length of time (sugar that is more than 12 percent of the flour weight inhibits fermentation), so this version will taste slightly less sweet than the yeasted one, a deficit completely overridden by the rich complexity of the sourdough. I have also changed the all-purpose flour to bread flour, which has more gluten, to counteract the starter’s propensity to loosen the gluten (the acids in the starter change the proteins, a natural part of sourdough baking). Recipe synopsis: Make the sourdough starter and let if ferment overnight for 12 hours. The next day, mix the dough and let it ferment for 2 hours. Shape the dough and let it proof for 5 hours. Bake the breads for 15 to 40 minutes, depending on their size. Evening before baking - mixing the sourdough starter: Knead starter into water until it is partially dissolved, then stir in the flour. Knead this firm dough until it is smooth. Remove 1 cup (200grams/7 ounces) of the starter to use in the final dough and place it in a sealed container at least four times its volume. (Place the remaining starter in a sealed container and refrigerate to use in the next bake.) Let the starter ferment until it has tripled in volume and is just starting to deflate, 8 to 12 hours. In a large bowl, beat together the water, the 3 eggs, salt, oil, and honey (measure the oil first, then use the same cup for measuring the honey — the oil will coat the cup and let the honey just slip right out) or sugar until the salt has dissolved and the mixture is fairly well combined. With your hands or a wooden spoon, mix in the bread flour all at once. When the mixture is a shaggy ball, scrape it out onto your work surface, add the starter, and knead until the dough is smooth, no more than 10 minutes. (Soak your mixing bowl in hot water now to clean and warm it for fermenting the dough.) This dough is very firm and should feel almost like modeling clay. If the dough is too firm to knead easily, add a tablespoon or two of water to it; if it seems too wet, add a few tablespoons flour. The dough should feel smooth and very firm but be easy to knead. Place the dough in the warm cleaned bowl and cover it with plastic wrap. Let the dough ferment for about 2 hours. It will probably not rise much, if at all. Line one or two large baking sheets, with parchment paper or oil them. Divide the dough into two 1-pound (450-gram) portions for loaves, one 1 1/2 pound (680-gram) portion for a large loaf and three small pieces for rolls (the easiest way to do this without a scale is to divide the dough into quarters and use one quarter for the rolls and the rest for the large loaf), or sixteen 2-ounce (60-gram) portions for rolls. Braid or shape them as desired, position them on the prepared sheet(s), and cover them well with plastic wrap. Let proof until tripled in size, about 5 hours. Meanwhile, 30 minutes before baking, arrange the oven racks in the lower and upper third positions if using two baking sheets or arrange one rack in the upper third position if using one sheet, and remove any racks above them. Preheat the oven to 350°F (180°C/gas mark 4). If desired, preheat one or two baking sheets to double with the baking sheet(s) the loaves are on. Beat the remaining egg with a pinch of salt for glazing the breads. When the loaves have tripled and do not push back when gently pressed with your finger but remain indented, brush them with the egg glaze. Bake rolls for 15 to 20 minutes, the 1-pound (450-gram) loaves for 25 to 35 minutes, or the 1 1/2-pound (680-gram) loaf for 35 to 45 minutes, until very well browned. After the first 20 minutes of baking, switch the loaves from front to back so that they brown evenly; if the large loaf is browning too quickly, tent it with foil. When the loaves are done, remove them from the oven and let cool on a rack. Geez, ZB, that's without a doubt the best Challah I've ever seen, bar none. Thanks for the unbelievably thorough post on how to do it, as well. As always, your photography is superb. I'll have to give this a try some day soon, now that I have your roadmap for success. The only problem is I don't have your dough handling skills. I'll never make it look this good, even with the step-by-step you've laid out for us. Bill said it all, Zolablue. Two minutes ago I would've lifted an eyebrow and frowned if someone whispered sourdough Challah in my ear. Now I'm awestruck. A Challah god(dess), wadda ya know. Thanks for posting the recipe, this is definitely moving to the Try Immediately list. Didn't it kill you to cut it? I agree that it stays moist forever. Amazing recipe. ... at how beautiful your (first!!) challah is. That beautifully tapered braid and gorgeous golden crumb are amazing! You guys are nice! Really, thanks so much, but this isn't so hard and enough of a fun time I'd love to braid bread every day! Reminds me of my youth and the long blonde braids I always wore. 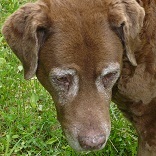 Browndog, believe it or not it wasn't hard at all to cut into it. I just couldn't wait to see inside! I've wanted to do a braided bread for a long time. I might even do so now that I've watched Glezer's video - she makes it look easy. 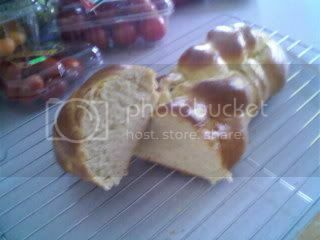 Wow- your challah is gorgeous, zolablue, and I have made challah for years and don't think any have turned out so lovely. I am now inspired to try the Glezer recipe. I own that book, but have not tried much from it. Thanks for posting and thanks for all your wonderful pictures! Zolablue your challah is just beautiful! I don't think I've ever seen one from any bakery braided so evenly and neatly as yours - you must have had very long hair to practise on :-) You mentioned that the crumb is creamy and soft and stayed like that for 5 days! That is really amazing - I'm ready to try it if it stays fresh for so long, and a challah!! The colour of yours is actually darker than any I've seen here, at least the ends are, but if you like it that way then I think that's all that matters. Did you knead it by hand like the recipes suggests? For a such a firm dough (is it really like modeling clay?) I'm thinking maybe to call up Popeye for some help :-) It's hard to imagine that such a firm dough will end up so soft and keep so well. Thanks for posting the link to the video as well - Maggie makes it look very easy. L_M, this was very easy to knead. I did do something kind of silly though. Glezer didn't say to dust the counter with flour so I thought perhaps this needed to be done without. Nope, that stuff was sticky especially trying to add in the levain! (duh) What I ended up doing is using fraisage to incorporate the levain into the dough mixture since my hands were already a sticky mess. After I scraped that off and dusted the counter for kneading it sure was easier. Kind of funny but all part of the learning. My dough was not really as firm as modeling clay but it somehow just felt right to me. I would say firm but pliable. I didn't want to get too much extra flour in it and you have to add a bit while you roll up the strands and then elongate them. My dough may have been a bit stickier than should have been during braiding but I just kept going. It really was very easy to work with and braid. I agree this turned out a littler darker than I would do next time. I did the same mistake with this as I did on the sourdough semolina. I cranked that oven up way further than it needed for this type of bread. I won't do that again because my oven really holds the heat well and even if I stand there with the door open to let heat out it seems it takes forever to go down in temp sometimes. Thanks all for your kind words, everyone. This was a wonderful baking experience. Ok Zolablue if you say it's easy to knead by hand then I'll give it a try...but it sounds like I should wear my apron :-) Did you get the dough to any sort of windowpane stage by the time you finished kneading? We have another holiday coming up soon so I'll make it in a few days and let you know know it goes. I just found this and I am awestruck. I must say that it was a sticky mess until I added enough flour while kneading on the counter, but now I'm wondering if I didn't add too much, but even when I had finished kneading it was far from being a firm dough. Does she give any instructions for kneading by machine? Maybe that way I'd be less tempted to add too much flour. I made one 3 stran braid and baked in a 1 lb. loaf pan, along with 2 mini pans that each had 4 balls of dough placed on an angle to each other that when proofed and baked came out looking quite like it was braided. Wow, that was a great bread. I tried the sourdough starter from Breadtopia, which worked like a charm, but I didn't really like the first sourdough bread I made. Yours had a little sweetener in it which I thought I would like better, and I did. I found it was not to complicated to make, though either added too little flour, or kneaded for too short a time, so the braid flattened out somewhat. The crumb is nice though, and the flavour fantastic, so I will go for a somewhat taller loaf next time. Thank you for the photos and description, Zolablue. I had not tried a braided loaf since my first failure over forty years ago. Wow, second time is a charm. I have not tasted nor cut my second challah, but it is a beauty. I can't cut it because I am taking it to my son's for Christmas dinner. I put the timer on to make sure I kneaded for the full time. I sprinkled it with sesame seeds, and when I put it in the oven, it just jumped and is huge and beautiful. My braids look better and stayed a little more separate this time, too. I have Secrets of a Jewish Baker and it is the best general bread and cake baking book I have. It is my go to book for everything. For challah, I go between that one and Maggie's Blessing of Bread. 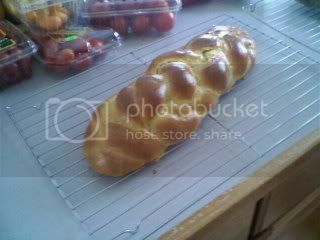 Hmm, I have made this challah twice and received rave reviews, both times, though my braids are not that pretty. However, I have one major question. How do you ever make enough to have some for toast? I guess I will be making some more in a week or two. It is hard to get as much as I like in a house where we shouldn't be eating as much bread as we do. Cordel - Here I am again apologizing for not seeing some of these posts over the holidays when I wasn't online much. Wow, I'm so glad you have tried this recipe and enjoyed making it. I need to try again myself! Ruth - I am sorry to say I don't know anything about that book. Have you tried doing a search on the site? I'll bet someone knows all about it. This is my new project for the weekend. Absolutely beautiful bread. This was wonderful. Thank you for sharing! I will have to try again to see if I can get it to braid properly. Thanks to zolablue, I was inspired to make this bread. First time, I put the whole batch in a rectangular pan and baked for 22 minutes. The texture was ethereal! However, clearly the batch was underbaked because there was a layer near the bottom that did not cook :) So this time, I made another batch, adding 15g extra sugar to the dough and then transforming the recipe into cinnamon raisin bread. I also proofed for quite a long time, maybe 18 hours at RT, until maybe 2.5x the original size. The bread was baked at 350F for 35 minutes this time. The result is below. Personal notes: The bread still made for a really really good cinnamon raisin bread; however, the original pillowy texture had been compromised, perhaps because this time the batch was overbaked. The extra sugar in the dough + the cinnamon-sugar swirl and raisins was just right for my taste. Next time, I will bake the batch at 28-29 minutes. Hopefully, I can regain the melt-in-your-mouth texture of the first batch while ensuring the bread is cooked all the way. Nothing wrong with that loaf..
What a beauty and I'm sure it tastes just awesome toasted with butter. Great toasted even without butter! I omitted the butter for 2 eggs sunny side up. I was happy, happy, happy! does it tate sour at all? if so how well does it go with the sweetness? There is a hint of tang, but no more. I think the tanginess renders a bit of complexity to an otherwise plain sweet cinnamon raisin bread. But maybe the real benefit of the SD is the creamy texture; even with the overbaked bread, somehow you get that some of that creaminess and mouth feel back with a just-lightly toasted piece. This recipe is so easy and the result so good, everyone ought to try it. my house is 78 to 80 degree will it really take 8 to 12 hours for the starter to be ready or need a 5 hour bulk? Still figuring out how to adjust to my own room temperature! That's your starter for building the next levain. Many sourdough recipes have you mix your levain so as to be able to reserve the amount you need to see the levain next time. So, for example, if the recipe for the levain calls for seeding it with 40 g of active starter, the total amount of levain will be what you need for the bread you are making plus an extra 40 g.
All of Hamelman's sourdough bread formulas are like this, for example. has popped up. Inoculated the starter at 04:30 and now have 37 minutes on my 2 hour bulk rise. (It is full of tiny bubbles in this 32°C heat.) Time to braid my first 6 strand. Never too old to learn a new trick, I say. Fun dough so far and if a little flour is used on the bench after a minute of stirring the dough and starter together, it is pretty manageable dough to knead until well blended. I came out with 1064g of dough, divide that by 6 and each braid strand gets 177g. I've been trying to work out my own recipe but failing so I'm glad to discover this. Got a question though: with the 5 hour proof do the braids not end up blending together? Are you giving the strands a fine coat of flour before braiding? Thanks for posting this!